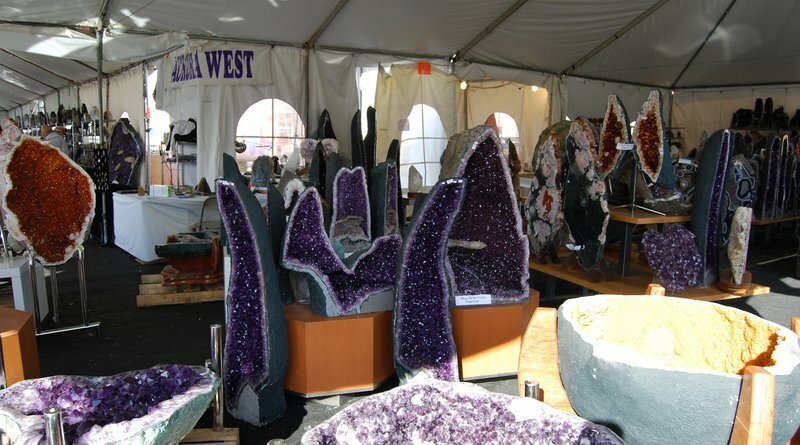 Hi, and thanks for visiting our photo essay on the Tucson Gem and Mineral Show. 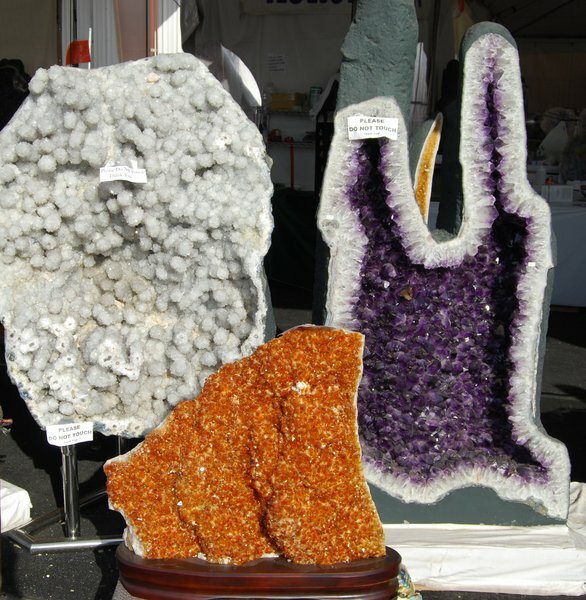 My wife, Kathi, and I (Jack) attend the Tucson show on an annual basis in order to obtain many of the incredible stones that we sell on both eBay and our own website. 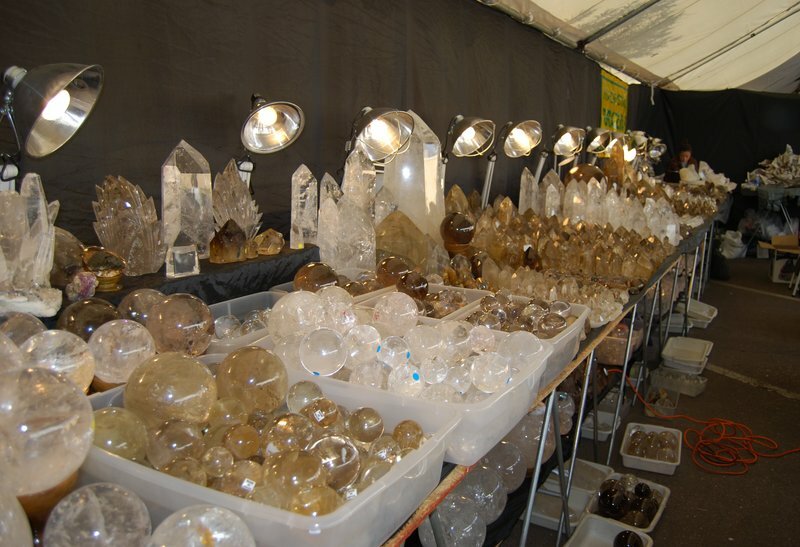 Before getting into the business of selling stones, I was a collector for over 40 years, and had heard and seen many references to Tucson, but had never experienced the show in person. I often wondered exactly what the big fuss was all about, and now Kathi and I know first hand. 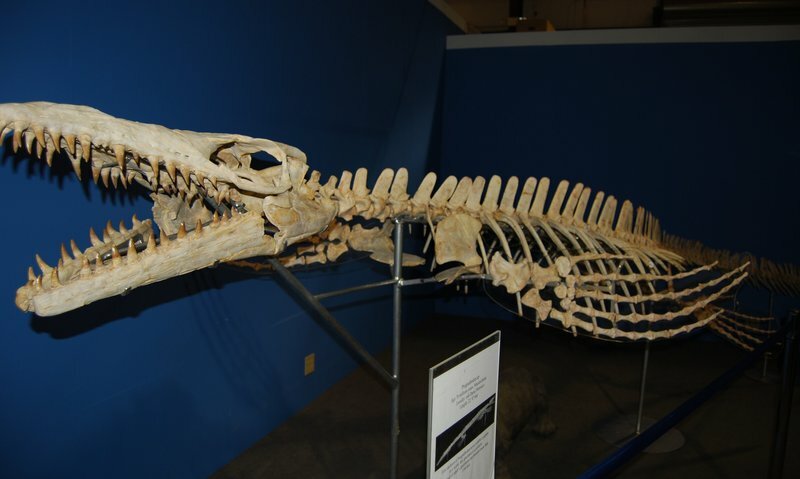 We wanted to put together this article for our friends and clients who may never have the opportunity to visit the Tucson show, might be hoping to attend in the future, or just wonder where and how we find the wonders that we do. Exactly What Is The Tucson Show? 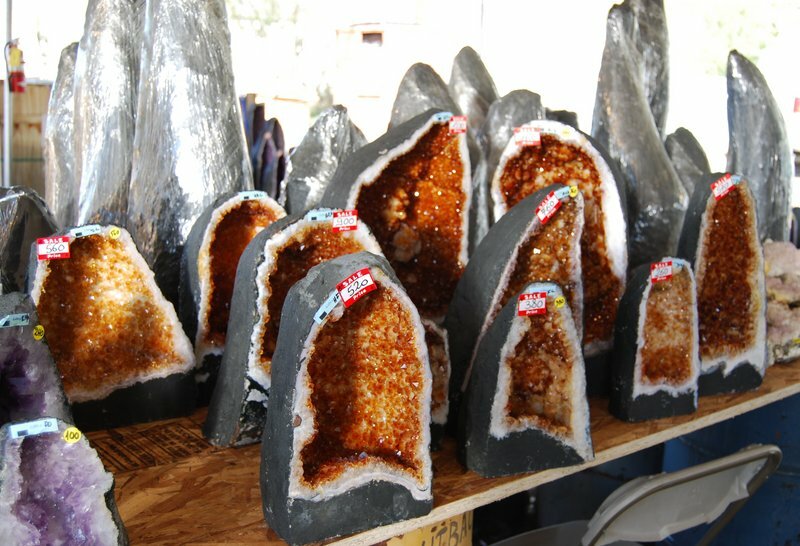 The Tucson Gem and Mineral Show is really not one show at all, but a collection of approximately forty separate shows, both wholesale and retail, held at different locations and at different but overlapping times during the month of February. The event dominates the city, with both sellers and buyers coming to Tucson from all over the world. As a note, if you want to buy at any of the wholesale shows you will need a resale license issued by the state in which you live. This is the license which permits you to buy without paying sales tax, and shows that you have a registered business where you live. Bring a copy of the license, and lots of business cards if you have them. There are literally thousands of dealers located all over the city at many different types of venues. Many of the hotels host their own shows. At the hotel shows, dealers are located in tents in the parking lots, in the function rooms inside the hotel, and in virtually every sleeping room in the building. Buyers walk up and down the halls, going in and out of room after room looking for that special deal or treasure. It is an exciting, time-consuming, and often exhausting process. There are also many shows held throughout the city at different locations that have been established specifically for the purpose of the Tucson event. Many dealers will both warehouse their material and sell at these locations. Finally, there are large indoor shows at convention center type locations. 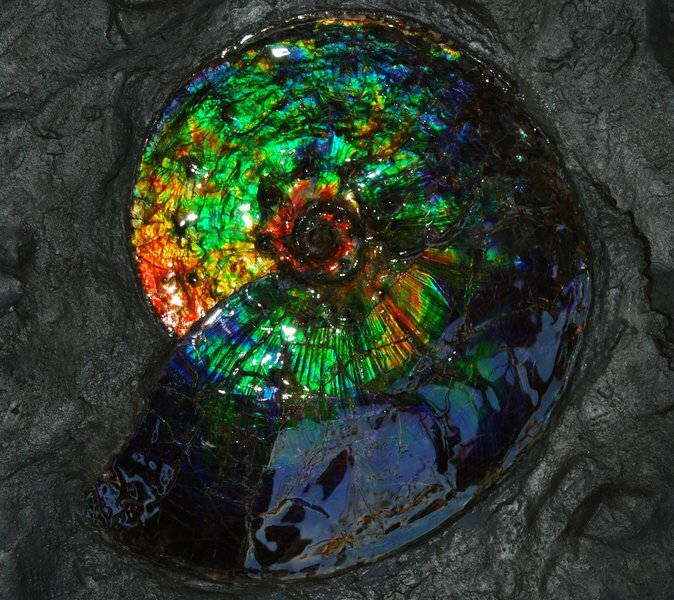 The various shows are divided among those offering minerals (both rough and polished), fossils, and jewelry, or some combination of the three. For buyers, planning for Tucson is no simple exercise. Due to there being so many shows at so many locations, and starting on different days, the logistics can be overwhelming, especially for first-time visitors. Hotel rooms and rental cars are at a premium, and it is important to make arrangements well ahead of time in order to avoid missing out altogether. Kathi and I usually finalize our plans no later than early November. This year, we drove the 1,000 miles from Boulder for the first time. This made for a somewhat shorter stay in Tucson, but we were able to avoid the dreaded ordeal of shipping our treasures home. Last year we mailed home 42 boxes, which made for a lot of packing, lugging to the post office, and then worrying about the stones until they arrived safely. Besides selling stones, Kathi creates and sells incredible wire wrapped pendants and earrings. 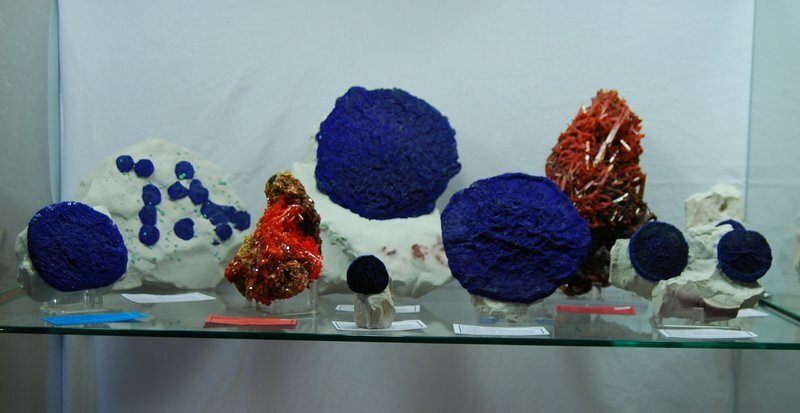 In previous years we have visited the jewelry shows as well as the mineral shows. 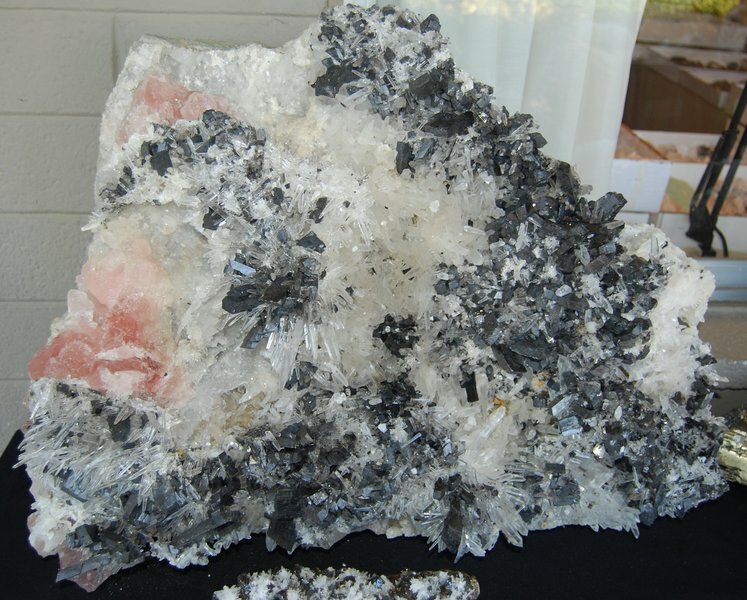 We focused on only the mineral shows this year, both because we have been able to find great material for Kathi at the various Denver shows, and because the jewelry shows in Tucson tend to be absolutely overwhelming. We guarantee that you have never seen as much jewelry in one place as at the various large jewelry shows in Tucson. They tend to be held in enormous tents that seem to go on forever. The offerings include finished jewelry of all kinds, cabochons and other material for making jewelry, and approximately, oh, maybe, one billion beads. Kathi and I find that it is better to look for cabs at some of the smaller dealers at the hotel shows, as the prices seem to be better than at the huge shows, and the process is much less hectic. 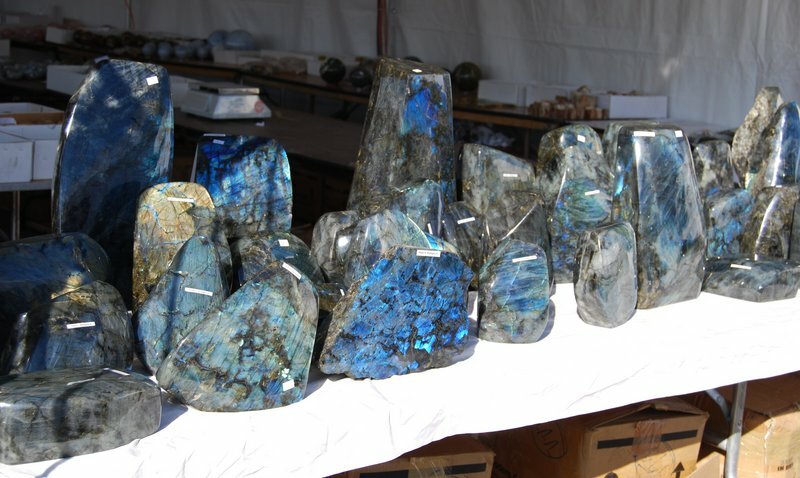 One of our favorite Labradorite dealers is from Madagascar, and comes to Tucson with tons of the stone, from very small pieces to stones almost too heavy to lift. We buy a lot of material from him, and he reciprocates by not only saving unopened boxes for us to pick through, but by allowing us to make out our own invoices, believe it or not. 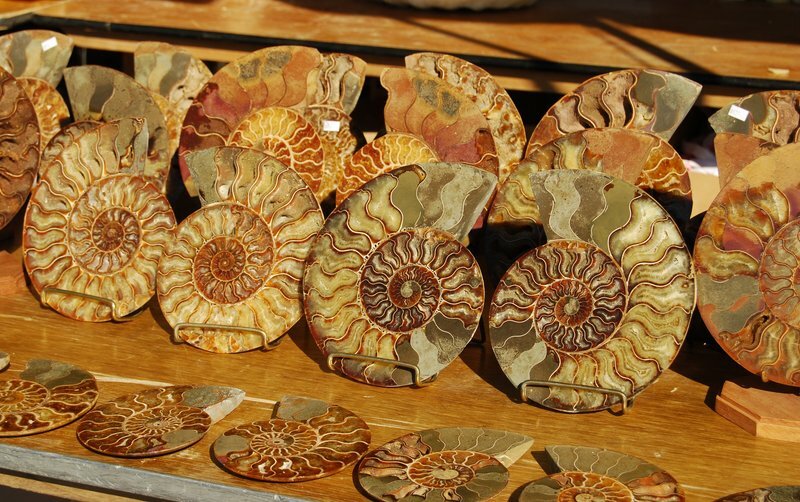 He also carries lots of Ammonites, which is a type of marine fossil. As well as tables full of Celestite geodes. The Globe-X show at the Days Inn is typical of the various hotel shows, with dealers offering their goods inside and out. 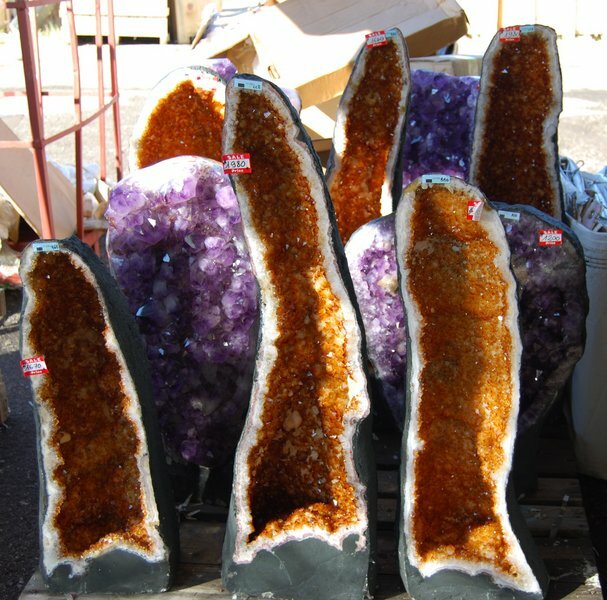 Among my very favorite things to look at in Tucson are the endless Amethyst and Citrine cathedrals and geodes. They are everywhere. I cannot imagine shipping these things all over the world. It would drive me crazy. The following set of photos is from one of the hotel ballroom dealers. Kathi and I will spend what seems like endless hours stooping over these tables hand picking the best of the best for our clients. It is probably the worst part of buying for us because it is extremely tiring and tedious work. I often leave these sessions with an aching back. We may look through 1,000 stones in order to pick out 20 or 30 to buy. What we do is take all of the stones from one of the little boxes and put them into an empty white flat. We then don't just look at them, but actually feel each stone, particularly along the rim (for palm stones). That is the only way to reliably find little nicks or chips on the edges of otherwise gorgeous pieces. We still wind up with the occasional bad stone in our selections, as there is no way to catch them all without spending a lifetime at the job. Once we get home, we again check the stones, and any baddies that snuck into our boxes either wind up in the flea market bin or are given away to kids. As an aside, China has obtained almost a monopoly on the processing of minerals. They buy rough material by the container load, cut and polish the stone, and ship it all over the world. Therefore, the wholesale dealers are pretty much held captive to whatever material the big Chinese suppliers have acquired for processing. This dealer never knows for sure what his supplier is going to send him, or what the quality will be. Two years ago the surprises were Tiger Jasper and Pietersite stones. Last year it was the great Moonstones that we were so lucky to get. This year he had no real big surprises, but other dealers sure did! Even with more common stones, the quality will vary greatly year to year, Tiger Eye is a good example. Sometimes it will have great chatoyance, and other years not. Kathi and I have one guiding principle when buying smaller stones: When we find something extraordinary, we buy as much of it as we can; all of it if possible. The primary reason is that we may never see the material in that quality again. There is also a secondary reason. If we have it, someone else doesn't. Some of you may have seen the beautiful Septarian and White Calcite hearts that we sometimes have for sale. They come from the dealer in the hotel room pictured below. 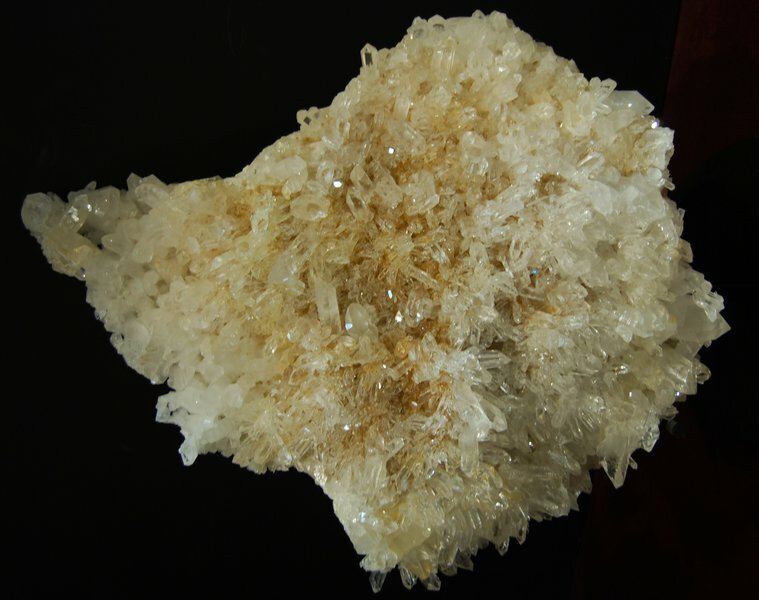 This seller (a really nice couple) is the only one that we know of who has the White Calcite material. 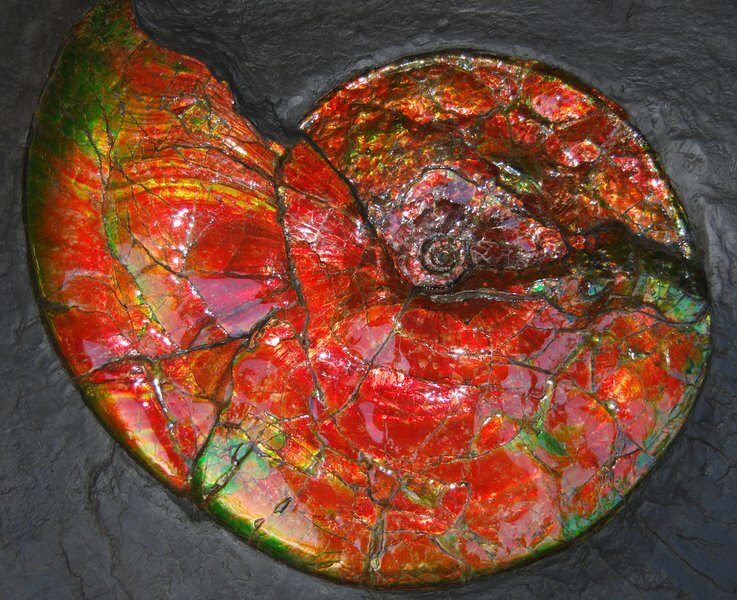 The black mineral in the material is Manganese, and the red is an iron compound. They also produce wonderful Septarian carvings. 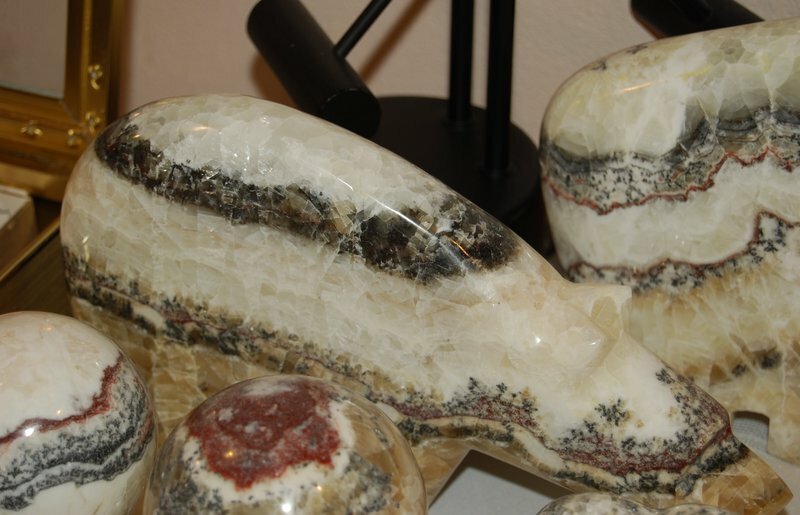 The White Calcite and Septarian both come from Utah, which is where they live. Subsequent to the writing of this essay, the wonderful woman of this dealer couple died from cancer. When Kathi and I learned of her passing at the next year's show, it was like we had been hit in the gut. Even though we would see the two of them, as with many of other suppliers, only once per year, we always tremendously enjoyed bantering with the two of them and thought of them as friends as much as dealers. Her husband is carrying on by himself, and it was clear that doing the show alone was about as hard for him as anything could be. He was not the only one of the three of us with tears in his eyes. Kathi and I offer him and their family our sincere condolences. Tumbled Stones anyone? 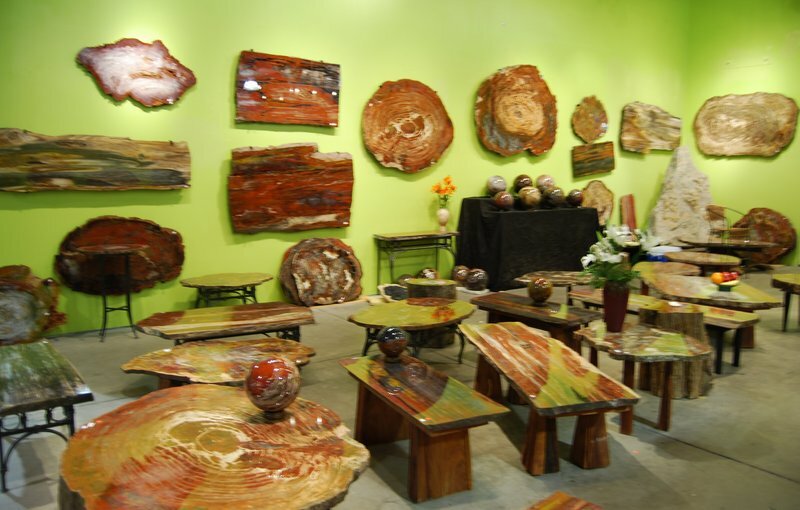 Here are photos from one of our favorite tumbled stone dealers. Most of the tumbled comes in either 1, 2, or 2.2 pound bags. Whenever possible we ask that the seller allow us to open the bags to check the quality of the stones. If the dealer knows that we are going to buy a lot of material, it is usually not a problem. Good sellers with good quality stones normally don't mind. Here are pictures from another of our favorite tumbled dealers. 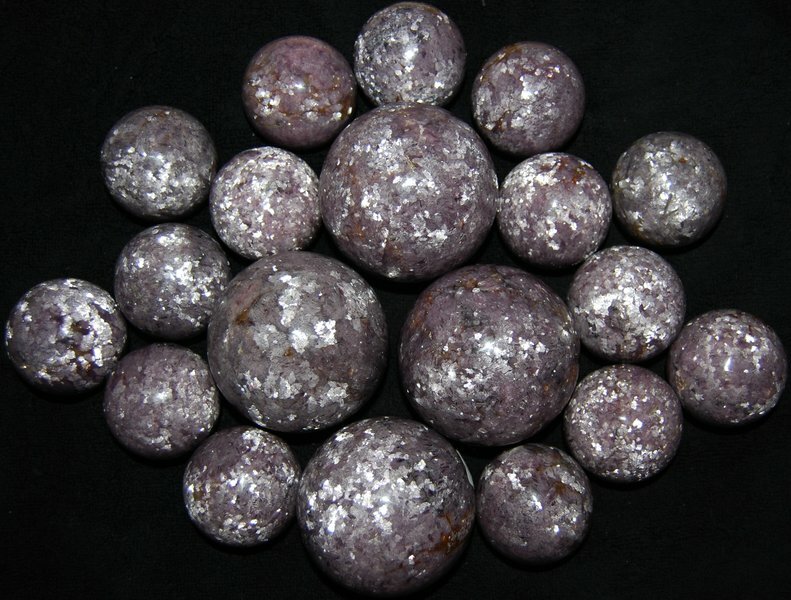 They sell in one pound bags, and have many of the harder to find and more expensive stones. 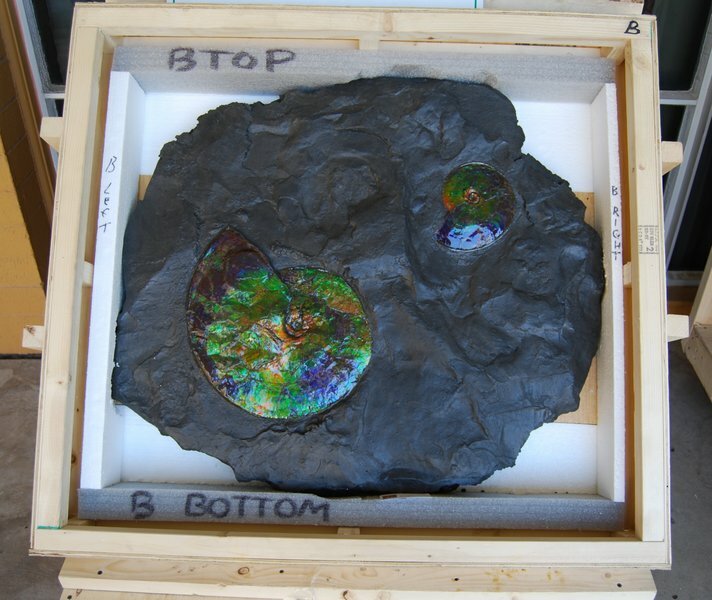 This is where we get our great Charoite, and this year we picked up incredible Blue Topaz and Kunzite. Another of our favorite dealer couples sells out of a showroom attached to their warehouse, which they recently moved to Tucson in order to best take advantage of the annual show. 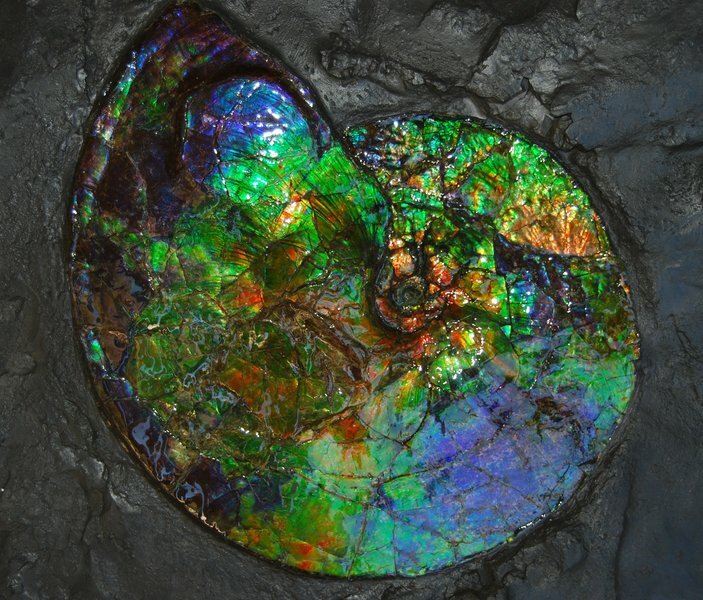 Back to Ammonites for a minute. 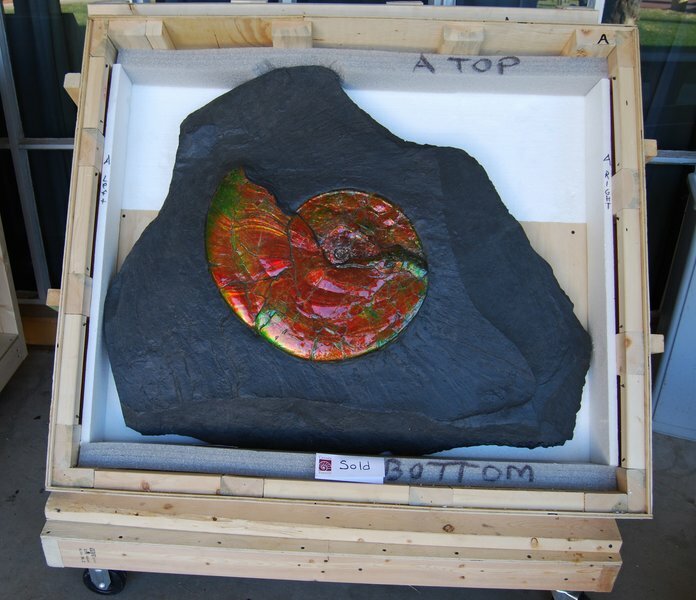 Outside the ballroom at the Inn Suites Hotel there were on display two crates of the most incredible Iridescent Ammonites in matrix that we have ever seen. So you can get a size perspective, the large red one is about two feet across! Some beautiful mineral specimens and Rhodonite spheres in a hotel room. One of the two super finds for us at this year's show was completely unexpected. If Kathi had not noticed a small box of spheres outside a dealer's hotel room, we might easily have passed these by. 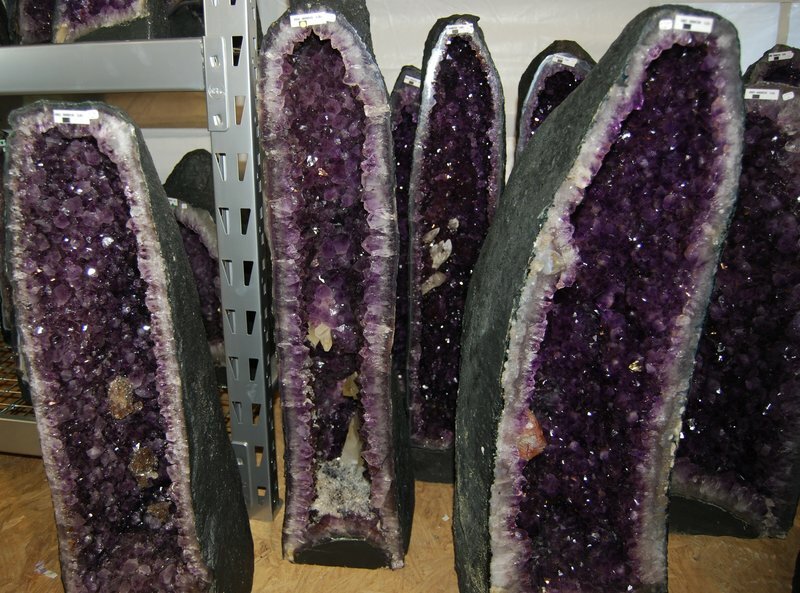 This dealer works in a mine in Mozambique which produces, by far, the most amazing Lepidolite that we have ever seen. Not only does the material (in Kathi's words) light up like a Christmas tree with jaw dropping sparkle, but it is apparently harder than normal Lepidolite so that it takes a polish like jasper or agate. We quickly (Ya gotta act fast!) gathered up every single super one that he had, and I grabbed a picture before we packed them up. These definitely will go on this year's Tucson Highlight Reel! 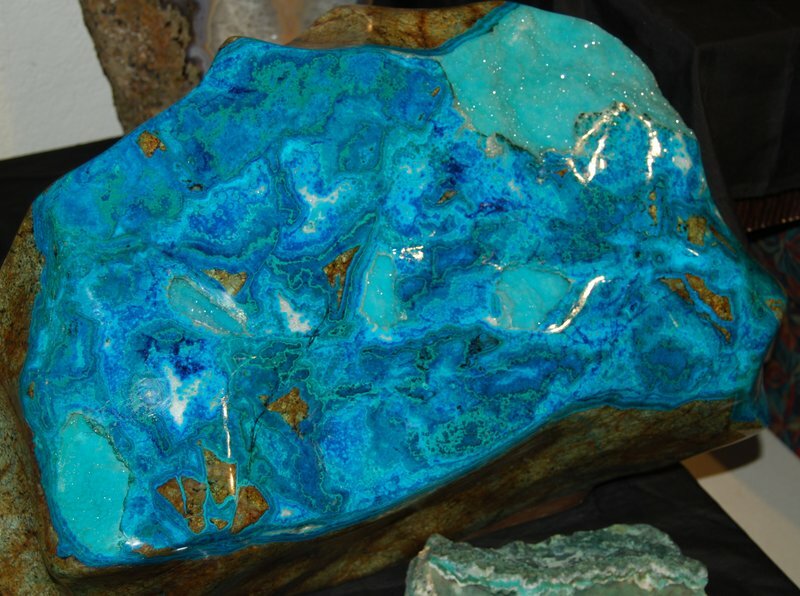 This dealer had the most amazing Chrysocolla and Chrysocolla with Cuprite in her hotel room. 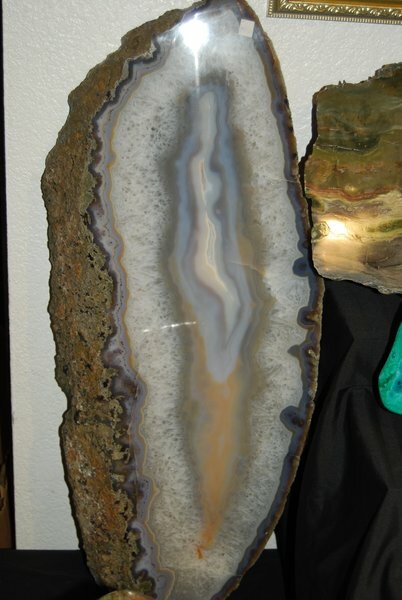 This piece of Agate is about 3 feet tall. I don't know what this is, but it sure is pretty, and about 2 feet across. One of our favorite dealers carries everything from Madagascar, as well as some material from South America. I am not sure that we are among their favorite buyers anymore because I knocked down their cute as can be toddler when she snuck up on my blind side. We wish them all the best with their second daughter who is on the way. 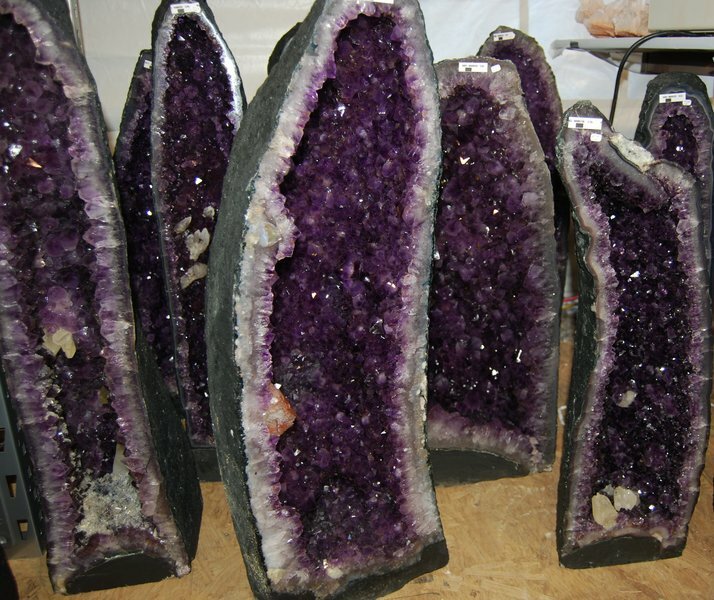 Dealers from Brazil have more Quartz and Amethyst than you can imagine. One of the sort of funny things that happens with these shows is that we will see the same specimen city after city and year after year at various shows. 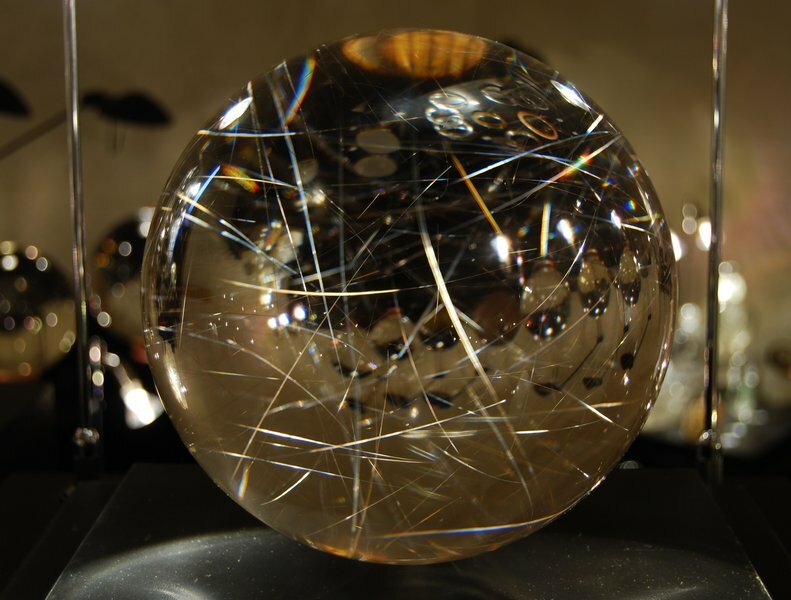 The most notable is the following Rutilated Quartz sphere. 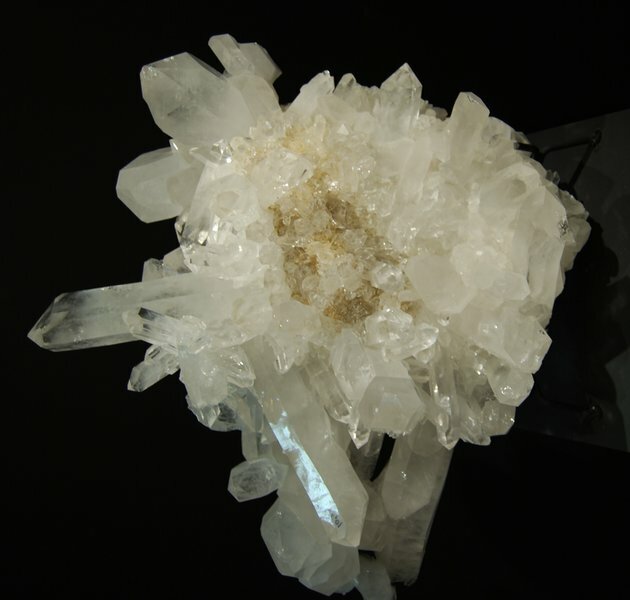 It is crystal clear with rutiles crisscrossing from surface to surface, and is about 10 inches in diameter. 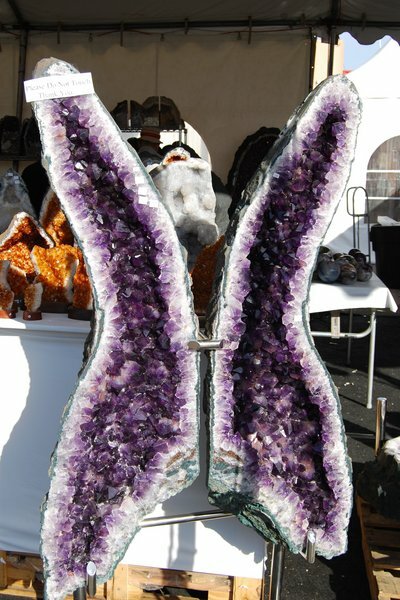 At one of the hotels, there is a dealer who specializes in extremely high-end Amethyst, Citrine, and other products from Brazil. Kathi and I both made the same mistake when we walked past the table shown in the following photo. 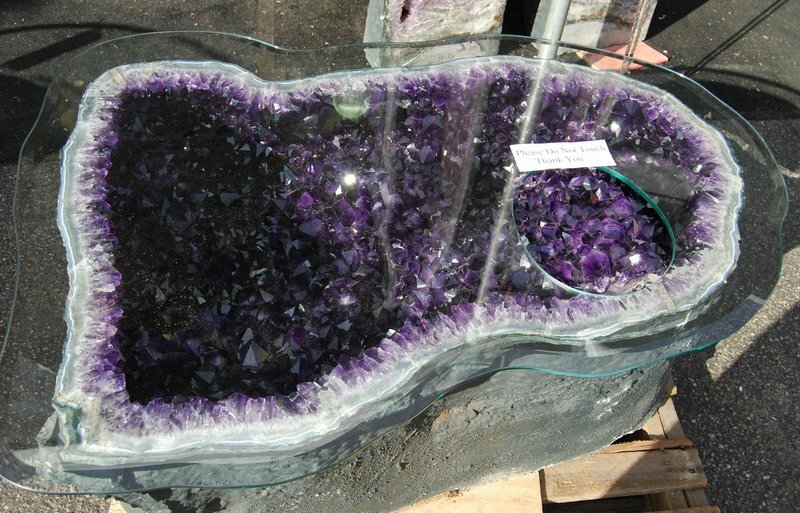 The glass top on Amethyst geode table is about 6 feet long. It was a very sunny day, and the glare made it look like there was a bowl of Amethyst crystals sitting on top of the table. Nope. It is a bunch of crystals sticking up out of the geode through a hole in the glass top. The Amethyst is fantastically dark with beautifully formed points. I asked a guy working in the tent how much it cost, and he told me that I probably didn't want to know. 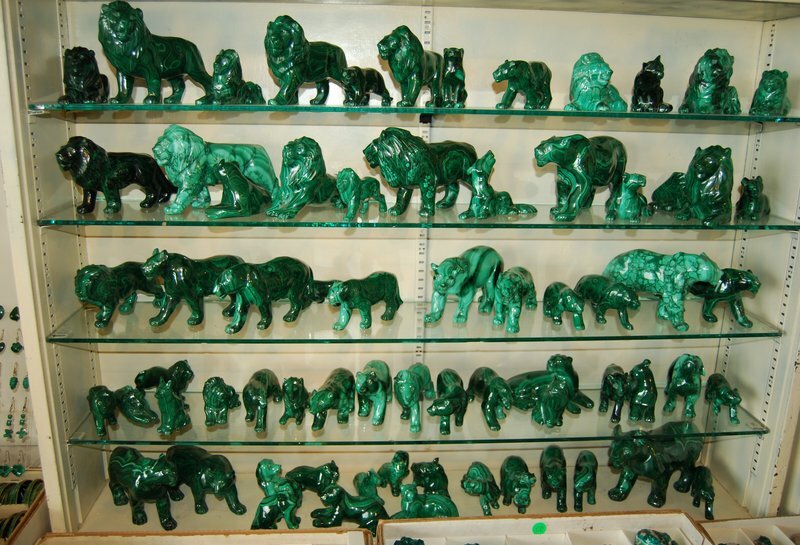 There is usually lots of carved Malachite at the show. 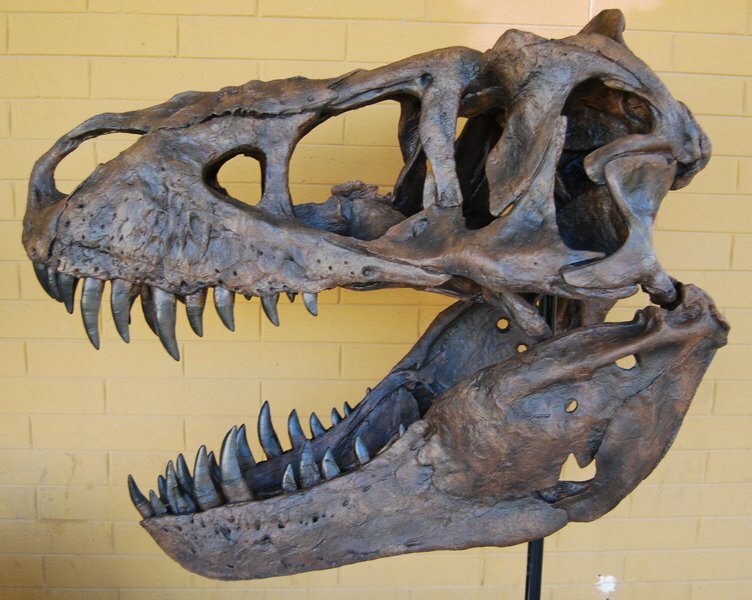 If you are into fossils, Tucson is the place to go. Finally, there is a show up north on Oracle Avenue that has some very high-end dealers. One of them has huge specimens of petrified wood. 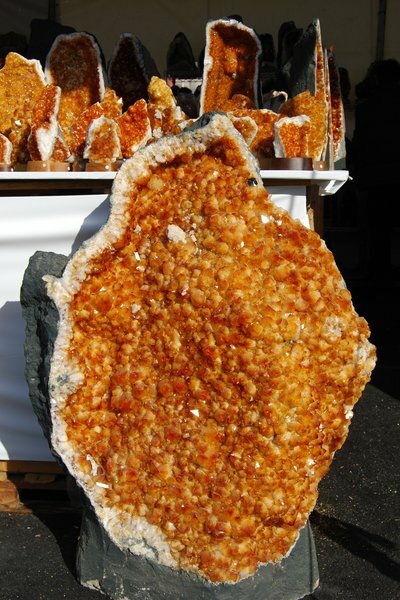 And one other has the most amazing and huge crystal cluster specimens that a rock lover could ever hope to have the privilege of seeing. Well, there you have it. You have now seen one thousandth of one percent of the Tucson show. We hope that you have enjoyed our photo essay. If you love stones, you really should try to make it to the show at least once. It is an experience beyond description, and one that you will remember forever. Thanks for coming along, and please let us know if we can ever be of any help.